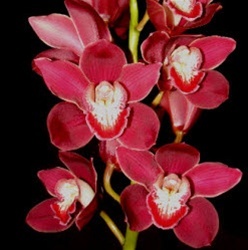 Red Mini-Cymbidium orchid flowers are a smaller version the classic Cymbidium. They have 8-12 blooms and will add an exotic flair to your wedding bouquet, centerpiece or flower arrangement. Free shipping! To retain the mini-cymbidium's radiance for up to two weeks, follow these healthful hints. If your mini-cymbidiums appear to be wilted upon unpacking, simply submerge whole spray for 10 to 15 minutes in cool tap water. Re-cut stems and change water 2 times a week. Use clean water, preferably with floral preservative. Keep flowers away from extended time in temperatures above 80 degrees F and below 40 degrees F. Holding Mini-Cymbidiums for more than a week at temperatures below 45 degrees can cause blooms to discolor or drop. Mini-Cymbidium orchids are slightly sensitive to ethylene. To avoid ethylene buildup, you'll want to ensure adequate ventilation and sanitary conditions. For your Wedding or Special Event, we recommend that you have your Wholesale Flowers or Wedding Flowers delivered 2 to 3 days before the actual event. For a weekend event, your flowers should be delivered on the Wednesday (or Thursday at the latest). Mini Cymbidiums are a smaller version of the classic cymbidium. Their bloom is smaller. The stems are about 20 to 25 inches in length and have on average of 8 to 12 blooms per stem! They come a variety of different colors including white, green, pink and yellow. Seasonally they are sometimes found in shades of burgundy and brown. Current available colors appear on the drop down menu. Available in straight boxes or assorted colors. Order early! Cymbidium Orchids are generally regarded as the most desirable and most popular orchids in the world. Our Mini-Cymbidium Orchids are securely packed and shipped directly from our farms to your door. You will love these beautiful Cymbidium Orchids. Cymbidium Orchids have water tubes to supply continuous water supply during shipping. Boxes will contain cotton like protective wrapping to ensure proper travel.